Carolina TarWheels: Fat Harold's Carolina Cruisin' - 200 miles in 3 days! Fat Harold's Carolina Cruisin' - 200 miles in 3 days! It's been several years since the last Fat Harold's Carolina Cruisin' was put together by Jeff Brafford. 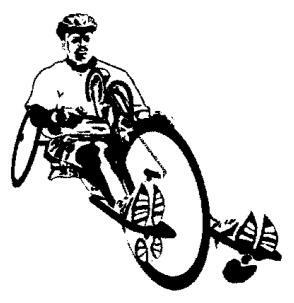 Handcyclist and bicyclist will ride 200 miles in 3 days in an effort to raise money for The Carolina TarWheels Organization. The ride proved to be a great fundraiser in years past for adaptive sports, and Brafford has been working hard to make the event happen again. We are very excited to announce that the 2012 version will be taking place from September 27th through the 29th! The previous events have totaled over $50,000 now! We hope to add a significant number to that total this year! This money made possible the purchase of equipment and provided programs allowing adults and kids with disabilities to participate in wheelchair recreation and sports that wouldn't otherwise have been possible. We have high hopes that with your help and support of this event we can continue to grow in what The TarWheels are able to offer to the disabled community as well as how many people we are able to reach! The tour will be preceded by a kick off event at Quaker Steak & Lube in Concord on the evening of September 26. The riders will roll out on the 27th from Mount Pleasant, NC and wind it's way along some scenic back-roads down to North Myrtle Beach, SC. Fat Harold's Beach Club will have an arrival party on Saturday, September 29th at 4:00pm! Please come and join us there to welcome the riders at the end of their 200 mile journey and enjoy some bar-b-que! If you would like to donate now using a credit card or paypal account, that can easily be done HERE! Please fill out the form completely and include if you are supporting a rider in particular in the "Purpose" field. For those who would like to ride in the event or volunteer, please contact Jeff Brafford as soon as possible! The TarWheels are extremely grateful for your continued support! Jeff Brafford - Sponsorship contact and coordinator for event.